Any business that deals with a large inventory of items knows that keeping track of your products is important. However, maintaining accountability of all the objects in your inventory can be difficult. Luckily, technology has provided a solution in the form of the equipment inventory list, an easy-to-use template that allows inventory managers to track equipment value, interest rate, years in service, down payment, location and description, among other things. The equipment inventory list template is customizable, meaning that it can be used to create a unique tool to suit your company’s needs. How you use the template is up to you, but these instructions will help you get started using the Equipment Inventory List. Start by downloading the template for free from this page. Once it is downloaded, open it using Microsoft Excel. Next, fill in the physical data for the item. This information will allow you to identify each individual item in your inventory. 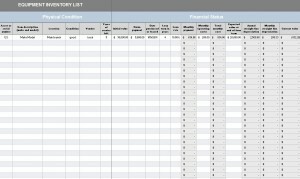 Lastly, fill out the financial data for the item. Only fill out the cells that do not have formulas already input into them. As soon as this information is entered, the monthly payment, total monthly cost, annual straight line depreciation, monthly straight line depreciation and current value will compute and display automatically. Customize the template to suit the needs of your business by only including the information necessary for your company. For instance, if your business only receives inventory items in new and unused condition, you may not need to track the condition of the item. 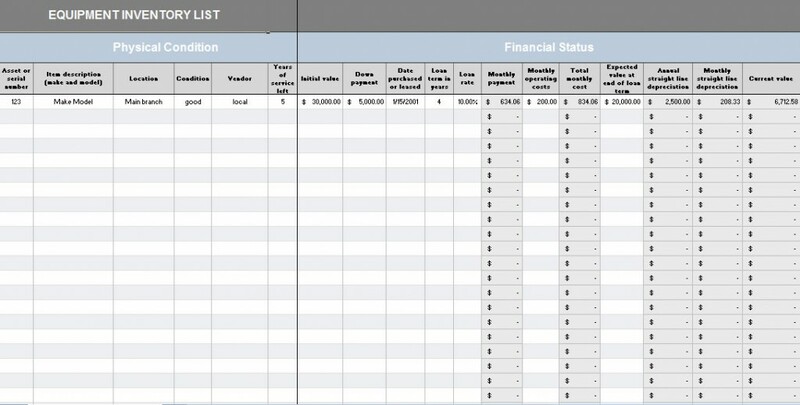 It is also possible to add formulas to the financial status part of the inventory template in order to calculate additional information that your business might need. Be careful when changing already existing formulas, and be sure to check your work. Remember to back up your inventory data in a separate place than in the inventory template. You do not want to lose your information in the case that your computer crashes and the data is not recoverable. Successful companies maintain detailed and accurate inventories of their products. This free and easy-to-use equipment inventory list template will allow you to do just that.